To find the most Chuck Liddell gear go to the UFC store and search for Chuck. Chuck Liddell is fearless, charismatic and through the years has managed to accumulate and maintain a huge flock of fans. He is responsible, many believe, for the popularity of Mixed Martial Arts in America. He is none other than the Iceman. Chuck Liddell held the title for the Ultimate Fighting Championship (UFC) in the light heavyweight division. His record is twenty wins, four losses and no draws. His wins include thirteen (T)KOs, one submission and six decisions. Losses were with four (T)KOs. To date, Chuck Liddell is one of the most popular MMA figures of all times. 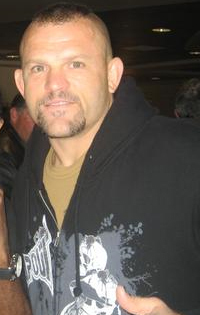 Known to most as a stand-up fighter, Chuck Liddell has a heavy background in the Martial Arts which he uses along with his natural abilities and even wrestling skills, making him both unique and effective. WHAT DOES CHUCK LIDDELL WEAR? Chuck Liddell has been seen in Tap Out frequently. His Tap Out shorts usually blaze "The Pit", which is where he works out and trains others. He also wears the Sinister Logo on his shorts. He uses the highest quality leather gloves with the UFC blazed across the gloves. Koei-Kan Karate-do is the style Liddell has studied the most. He began his training when he was only twelve years old. Koei-Kan is a unique form of full contact karate called Bogu Kumite, or fighting with armor on. This allows the practitioner to strike and be struck using full force but without the worry of serious injuries. It also focuses on methods of body transfer, dodging, evasion, footwork, rolling and breakfalls, all of which have proved extremely useful in his MMA career. Kenpo Karate is another Martial Arts style the Iceman relies heavily upon when fighting. Emphasizing the use of hands and feet. Liddell also incorporates his wrestling techniques when fighting. He was a Division 1 wrestler at California Polytechnic State University in San Luis Obispo in 1995. He has also holds a purple belt in Brazilian Jiu Jitsu. Groundfighting, chokeholds, and joint-locks are all applications Jiu Jitsu teaches, believing that mastering those moves allows a smaller, weaker person to defend themselves by using these techniques and leverages. In addition to wrestling and Jiu Jitsu, Liddell is trained in kickboxing as well. It is easy to see how all of the martial art styles Liddell is versed in would boost his UFC success along, but it is his natural skills and abilities that gave him the upper edge. His take down defense and knockout ability has made him immensely popular and exciting to watch. He is also known for his relaxed hands-down stance and relaxed fist striking technique. He has a training video to help others train in the mma as he has. The Pit Workout uses training methods such as CrossFit which is sweeping the nations right now. Chuck, the Iceman, Liddell was born on December 17, 1969, in Santa Barbara, California. He was raised primarily by his mother and grandparents after his parents divorced. In the DVD, Ultimate Iceman, Liddell attributes much of his fighting roots to his grandfather who tolerated no non-sense and even built a boxing ring for he and his brother and sister to duke it out in when they were at odds. At the age of twelve, he began studying Koei-Kan and even has a tattoo on his scalp that reads Koei-Kan which in Japanese means Prosper with Happiness. He also has a tattoo on his shoulder that says “Kempo”. While in San Marcos High School, Liddell was a starter on the football team for four years. He then attended California Polytecnic State University where he was a Division 1 wrestler. He graduated with a Bachelor of Arts Degree in Business/Accounting in 1995. On May 17, 1998, the “Iceman” won his MMA debut. It was at UFC 17 against Noe Hernandez, where he won by decision. Though two fights later he was defeated by Jeremy Horn, he went on to ten wins against such contenders as Kevin Rnadleman, Guy Mezger, Jeff Monson, Murilo Bustamente, Amar Suloey, Vitor Belfot and Renato Sobrall (Babalu). But that streak would come to an end with his loss to Randy Couture which is part of the three-ring saga between Liddell, Couture and Tito Ortiz. Ortiz was the reigning UFC champion and with his powerful “ground and pound” technique, he was quite popular. With Liddell collecting a large following himself, Ortiz was the one to beat and many thought the “Iceman” was just the one who could do it. There was one problem though, Ortiz refused to fight Liddell saying their friendship was too strong. The “Iceman”, however, did not feel the same and wanted to fight him, but to no avail. Eventually, it was deemed that the closest thing to a match between the two would have to be an interim title fight with Randy Couture. On June 6, 2003 at UFC 43, Liddell and Couture fought it out. Although it was widely believed that Liddell would easily take the win, such was not the case. Courture, who had just been moved down from heavyweight to light heavyweight, managed to not only counterbalance Liddell’s powerful hooks, he came back with powerful punches of his own, so much so that by round three, the referee forced a stoppage. Couture became affectionately known as “Captain America” and the “Iceman” went on to represent the UFC in the Japanese Pride Fighting Championship, but did not fight in the regular UFC for almost a year. 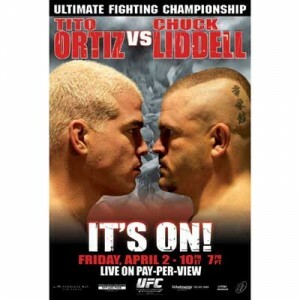 During Liddell’s break from the UFC, Tito and Couture fought at UFC 44. Though once again, Couture was the underdog, he won with a unanimous decision and became the light heavyweight champion. The “Iceman” and “Captain America” fought again in UFC 52 and this time Liddell proved himself to his many fans by winning with a knock out in the very first round. Liddell earned the title of UFC champ. While Liddell held the title, he became even more popular, appearing in movies and television shows. He had already coached on the reality show, “The Ultimate Fighter.” It was at this time that mixed martial arts began to really take off in America and many attribute that to Liddell. Holding his title for four consecutive fights, Liddell eventually lost it to Quinton “Rampage” Jackson. It was after that he and Ortiz finally met in the ring in UFC 47 on April 2, 2004. The fight was titled, “It’s On!” and indeed, it was. Though Ortiz claimed that he and Liddell had made a pact never to fight, Liddell said that was not true and scored a TKO victory. The two rivals fought again in UFC 66 and Liddell won again with a TKO in round three. Needless to say, the “Iceman’s” popularity was ever growing and he did not disappoint his fans. Liddell was on a roll, knocking out Vernon Tiger White and went on to beat Jeremy Horn with a TKO. Then he beat Couture again, Sobral again and Tito Ortiz…again. When Liddell had traveled to Japan to fight in Prides Middleweight Grand Prix, which was a single elimination contest, the Iceman was favored to win against Quinton Rampage Jackson but he did not. Jackson won by a TKO in round two. Jackson and Liddell fought again when Pride fell and Jackson joined the UFC and in a rematch in UFC 71 , Jackson took the title with a first round TKO. Liddells trouble did not end with Jackson, however. In UFC 88, on September 6, 2008, Rashad Evans won with one of the greatest knockout punches in UFC history. Liddell fought again on April 18 at UFC 97 against Mauricio "Shogun" Rua in Montreal. Shogun won by a first round TKO in round one. UFC President Dana White declared then that Liddell, the “Iceman”, would never fight again and added, "At the end of the day, I care about these guys. I don't want to see anybody stick around too long. You're never going to see Chuck Liddell on the canvas again." Will the “Iceman” come out of retirement and fight again? Some fans argue that he will and others are sure he will not. Bets have been placed and hopes have been raised and hopes have been shot down. No matter if he does or does not, the fact remains, Chuck Liddell, he is the “Iceman”. Liddell is loved by millions…always has been, always will be. On June 12, 2010, Liddell went up against Rich Franklin at UFC 115. He was holding hs own and then some until Franklin connected with a counter right hook to the chin to knock Liddell out in the first round. Earlier in the fight Franklin had broken his arm when he blocked a kick from Liddell, but he used the other arm to knock Liddell out. Chuck and Randy Couture are for second place for having the most wins in the UFC at 16, behind Matt Hughes' 18. On December 29, as the year was coming to an end, the career of one of UFC ‘s great, Chuck Liddell, came to an end as well. After more than a decade in the UFC, Chuck Liddell announced his retirement. With an impressive record of 21-8, the 205 pound champion and business school graduate said that he has plans to accept a position as the UFC's Executive Vice President of Business Development. "I want to thank Frank, Lorenzo, and Dana for everything they’ve done for me over the years and for the sport. Most of all, I want to thank my fans, my family," said Liddell. "I love this sport and I’m excited going into a new stage in my life and keep promoting the best sport in the world and the sport I love. They’re giving me the opportunity again to keep promoting and keep doing stuff now that I’m retired." Liddell, a.k.a. "The Iceman", is thought by many to be responsible for the popularity of MMA as we know it today. The charismatic 41 year old has won against the likes of Randy Couture, Tito Ortiz and Renato Sobral. With five of Liddell's eight losses occurring in his last six fights, UFC President Dana White was in favor of the retirement and possibly behind it. "I don’t want to see anyone stick around too long and I don’t want to see anybody get hurt," White commented. "In the almost 20-year history of the UFC there’s never been a death or a serious injury." "The Iceman" won the UFC's Light-Heavyweight title in 2005 and made four consecutive title defenses before losing the belt to Quinton Jackson in 2007. "We owe a lot to Chuck Liddell," White concluded. Many saddened fans who have cheered for "The Iceman" through the years share the sentiments and feel they too owe a lot to their hero, Chuck Liddell.